What to know: Delightful short film with a message of kindness and hope. What a delightful short film. 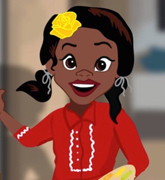 Hats off to the creator, Florida Bell Griffin whose talent as both a story teller and a filmmaker bring a message of kindness and hope in this animated piece. As a gardener myself, I particularly resonate with the storyline and love the presentation by a young African American girl. I wholeheartedly recommend this for our KIDS FIRST! Film Festival partners and give it 4 out of 5 stars. I recommend it for ages 5 to 12. Reviewed by Julie S., KIDS FIRST! Adult Juror. 2D, hand-drawn, animated short film inspired by the children's book, "Where Little Flower Got Her Power." The ten-year-old Little Flower is an artist who loves painting flowers. Her big imagination gives her an artistic super power that can bring whatever she paints to life. After her personified flowers are painted, they talk to her. The storyline is developed around the meaning of her favorite flowers, which are associated with memorable incidents that impacted her life. Little Flower exchanges greetings with the Black Poplar, Mugwort and Almond Flowers, whose names mean courage, happiness and hope.